These three cookies are never fail Christmas cookie choices. They are on the platter every Christmas no matter who comes to visit. My mother made them when I was growing up and I’m sure her mother, my grandmother, made them when my mother was growing up. Well, now I’m the mother and grandmother and the tradition lives on. My husband would never stand a Christmas without the candy cane cookies, the molasses krinkles are loved by everyone and make a batch so big they’ll last until the last day of the season, and the cherry roll ups are a delicate, but easy to make cookie that makes you wonder how something so easy can taste so delicious. If I attend a cookie exchange, it’s one of these I bring with me. If I worry that the molasses krinkles are a little plain, I dip them half-way in white chocolate and add a few sprinkles for sparkle. These three cookies will make you sparkle at any cookie exchange though with everyone asking you for the recipe. I sent the molasses krinkles with my husband to a men’s meeting at church once and the men were stuffing them in their pockets on the way out. My daughter thinks the candy cane cookies are more for show than flavor, but they do have a light peppermint flavor that is very pleasing. As for the cherry roll ups, they’re my favorite. 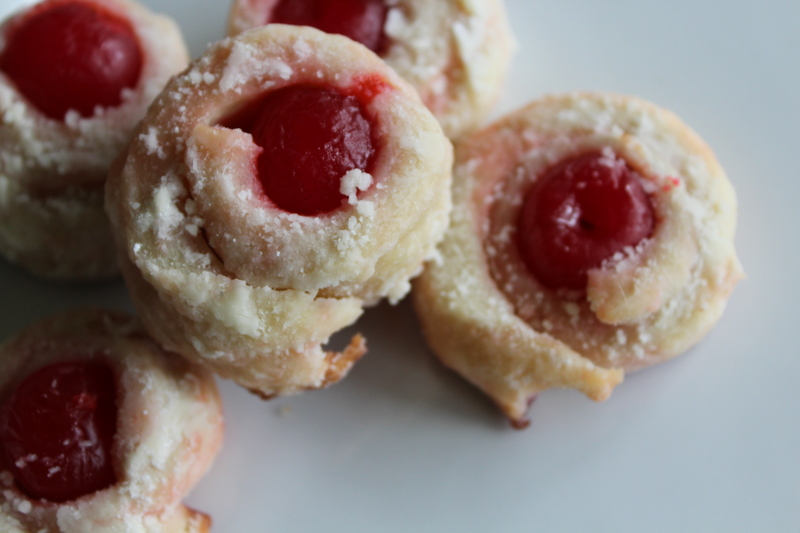 They aren’t as sweet as most cookies, but are full of flavor and you can pop one in your mouth all at once for a burst of cherry flavor, sort of like a mini cherry pie. YUM! You can find the recipes by clicking on the titles. Download or print them for later, or just make yourself an after Christmas treat! Let us know what your favorites are in the comments so that we can try them next year. We’d love to add yours to our list of favorites!